Our private label offering is an important part of our business because we know it’s an important part of yours! 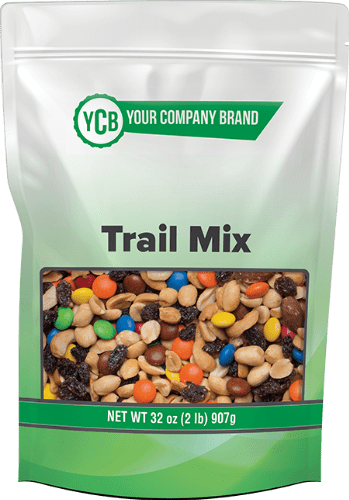 At Eillien's Candies, we're committed to providing our customers full private label program offerings for candies, nuts, trail mixes, baking goods, seeds, and dried fruits. We make these products available in a wide range of packaging options to meet your needs. We can serve as your one-stop shop for these programs so that the packaging has a consistent look across items, the ordering process is simplified, and the order arrives on one truck at the frequency you need. Custom packaging and labeling is our specialty, enabling flexibility and convenience for buyers in any channel of business. We currently service customers in many different markets and channels including grocery, convenience, mass, farm and home, drug, specialty, and catalog. Eillien's warehouses all of its own bulk candy, nuts, seeds & grains, dried fruits and trail mixes on-site. This gives us the ability to quickly respond to your needs in assembling your order. As we custom-package your order, we can use your existing control label and packaging design or our talented design staff can create an attractive label or packaging design for your review. Our design staff has worked to create custom packaging designs with many of our customers. Our packaging capabilities are centered on your needs. From tiny ½ ounce gourmet sizes to large 5-pound bulk value bags, Eillien's will work with you to find the best solution to your needs. We also offer seasonal custom packaging to help you boost your sales during Christmas, Valentine’s Day, Easter, Summer, and Halloween. In addition, we can provide a wide variety of specialty packaging for your unique needs, including re-sealable pouch bags, plastic and ceramic containers, tins, trays, and more. No matter what your needs are, Eillien’s Candies is here to provide solutions that you and your customers will love. Please contact us for further information, minimum ordering requirements, and an in-depth review of private label options for your needs.